Skillet dinners make for the perfect weeknight dinners. 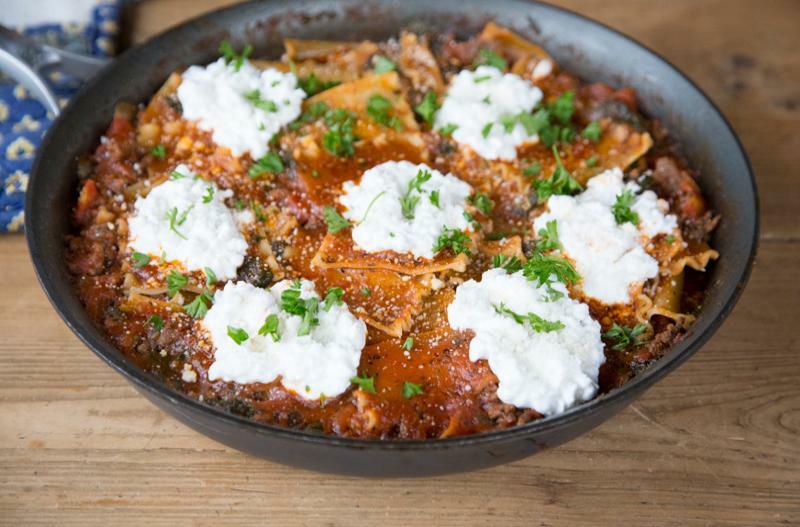 This one has all the amazing flavors of lasagna - made in a fraction of the time it takes to put it together in the casserole dish. Reheat the meat sauce (that is frozen) and then float in the broken lasagna noodles and stock. Cover and simmer until pasta is cooked through. Add the cheese dollops on top to complete the lasagna flavors! Open the diced tomatoes and tomato sauce. In a large skillet, brown the ground beef with the minced onion and garlic. Drain, if needed. Stir in the diced tomatoes, tomato sauce, spinach, and Italian seasoning. Bring to bubbling over medium heat. Stir in broken lasagna noodles and stock, pressing the noodles all the way into the liquid. Cover with tight fitting lid and simmer over medium low heat for 8 to 10 minutes, or until pasta has absorbed the liquid. Note: sauce will thicken some, as it cools. While pasta is cooking, mix together the cottage cheese and grated Parmesan cheese. Dollop on top of the spinach lasagna, after pasta has cooked. Serve Spinach Lasagna Skillet with side salad. Thaw 2 boxes of frozen spinach, enough to get it out of the box and into the freezer bag. Put baggie in the freezer and freeze up to 6 months in fridge freezer or 12 months in a deep freezer. Thaw in the fridge overnight, or a warm bowl of water for about 20 minutes, before transferring to the skillet to reheat the meat sauce and then add the broken lasagna noodles and stock, as directed. Omit the cottage cheese dollops for dairy free meal. 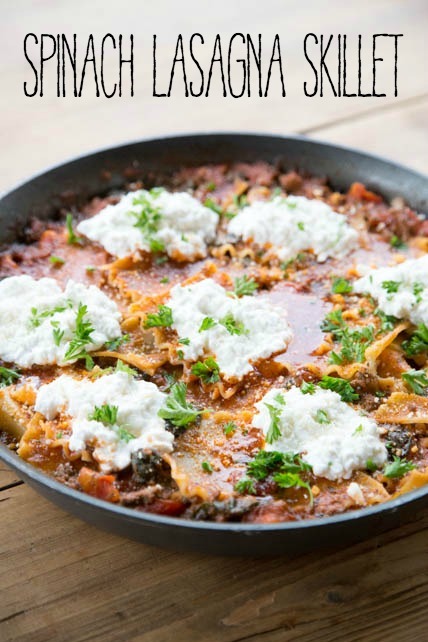 Use gluten-free lasagna noodles or small shell pasta noodles (8 oz. per 4 servings). Thaw and reheat in large skillet. Once warmed through, stir in the broken lasagna noodles and stock. Cover and cook for 10 minutes, or until pasta is tender. Serve with cottage cheese-Parmesan dollops/garnish, and salad.